A big part of economic and social development is how you go from the personal interactions of the traditional village to the impersonal markets and anonymous institutions of modern societies. This is where the interdisciplinary field of “cultural evolution” may be most helpful in explaining the wealth and poverty of nations today. Cultural evolutionists want to uncover the deepest psychological primitives behind “human ultra-sociality” and social institutions, i.e., how how humans went from the “Lascaux caves to Goldman Sachs”. And more than anyone else, they’ve been doing behavioural experiments in small-scale societies and developing countries (something economists are now also beginning to do). In other disciplines (such as psychology and behavioural economics), most experiments to date have been conducted at university labs with students in developed countries, with the results having a pronounced WEIRD bias. The three games conducted in the field with substantial monetary stakes were the Dictator Game (DG), the Ultimatum Game (UG), and the Third Party Punishment Game (TPG). All of these simulate, in controlled settings, interaction between strangers intended to tease out and measure the existence of ‘fairness’ norms. The big general finding is that people in larger, more complex societies are more likely to split pots of money with strangers on a 50-50 basis. They are also more likely to have norms which enforce that outcome. Ensminger & Henrich find there is a lot of variation in behaviour across the sample societies, but purely selfish behaviour, on average, is not found in any of them. (An exception which comes closest may be the Hadza, a small hunter-gatherer group in Tanzania, whose modal offer in DG was zero). 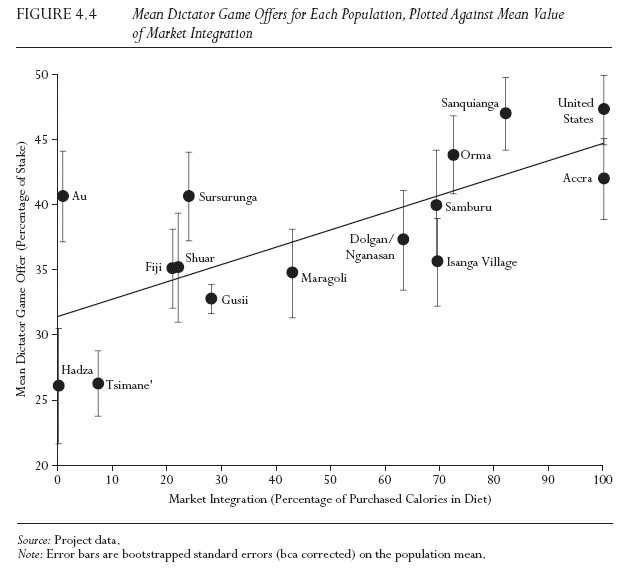 Every society shows a positive mean offer in DG (as opposed to zero). 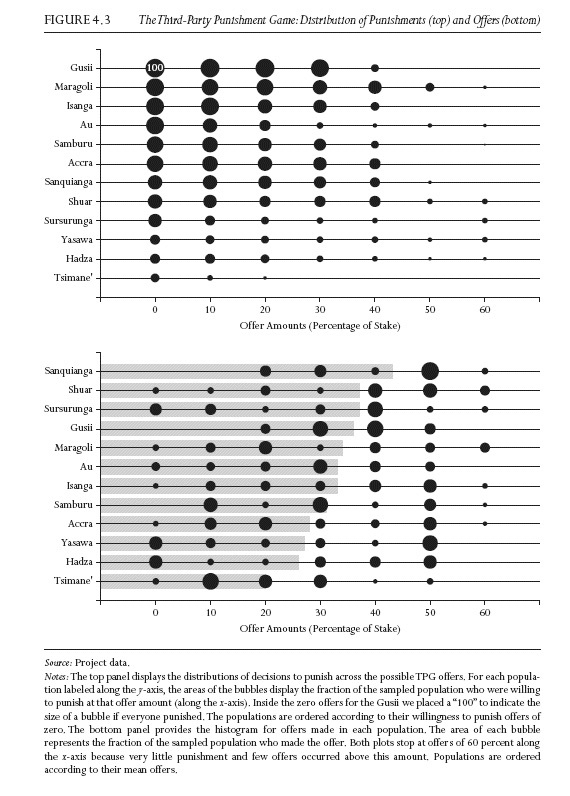 And in all societies sampled, there is some offer that is perceived as just too low and gets rejected (in UG) or punished (in TPG), with both rejections and punishments declining as the offer approaches 50% of the total. However, the “minimum acceptable offers” do vary substantially from society to society. The X-axis = the percentage of the money offered by the ‘dictator’. 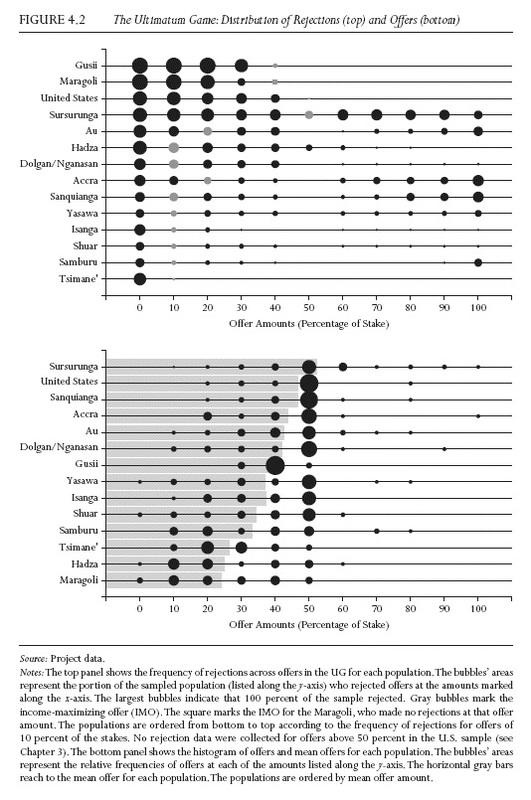 Grey bars = the mean offer for each population. The size of the bubbles = the fraction of the sample making those offers. 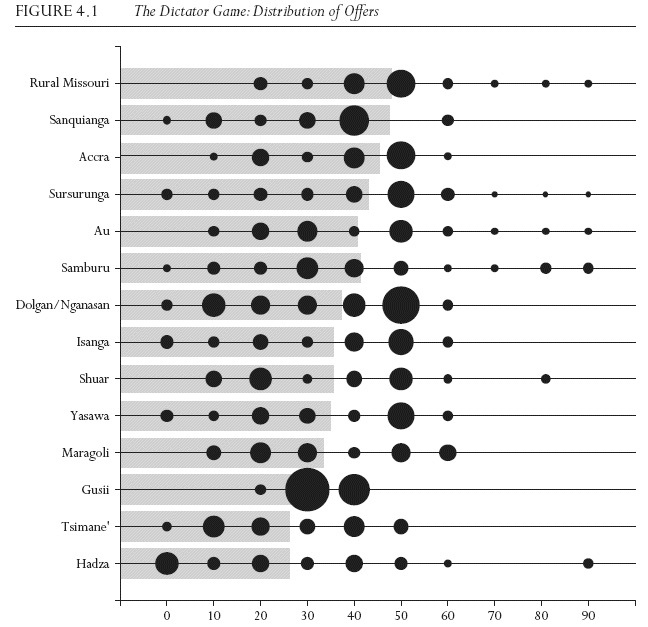 Also see the chart of distribution of results for UG and TPG. The average amount of money offered by first parties in all three games increases with the degree of their community’s market integration (as measured by % of calories obtained in the market). ‘Fairness’ also increases with individuals’ participation in a major world religion, as represented in the sample by Christianity and Islam (as opposed to a ‘traditional’ religion lacking “high moralising gods“). “People from larger communities punish more” in TPG. This is consistent with claims that more anonymous societies depend on “altruistic punishment”, the supposed tendency of some people to punish norm-violators and free-riders even when they are not direct victims, and often at great cost to themselves. The amount of third-party punishment meted out in TPG is a robust predictor of offers made by the proposer in the DG (a game with no punishment option) and of offers made by the proposer in the two-party UG. This may be evidence for the internalisation of fairness norms. “[L]arger communities with greater punishment and fairness…are strongly associated with larger ethnic groups”, which is taken as consistent with their theoretical prediction that “[fairness] norms can spread as a consequence of their group-beneficial effects”. But the amount of variation in the data explained by the variables of interest is fairly small. Low R-squared is usually not important, but in this case it matters. There are real trends in the noise, but obviously much more is going on in the data to differentiate these societies than Ensminger & Henrich explore. Besides, what about reverse causation?! All this screams endogeneity! 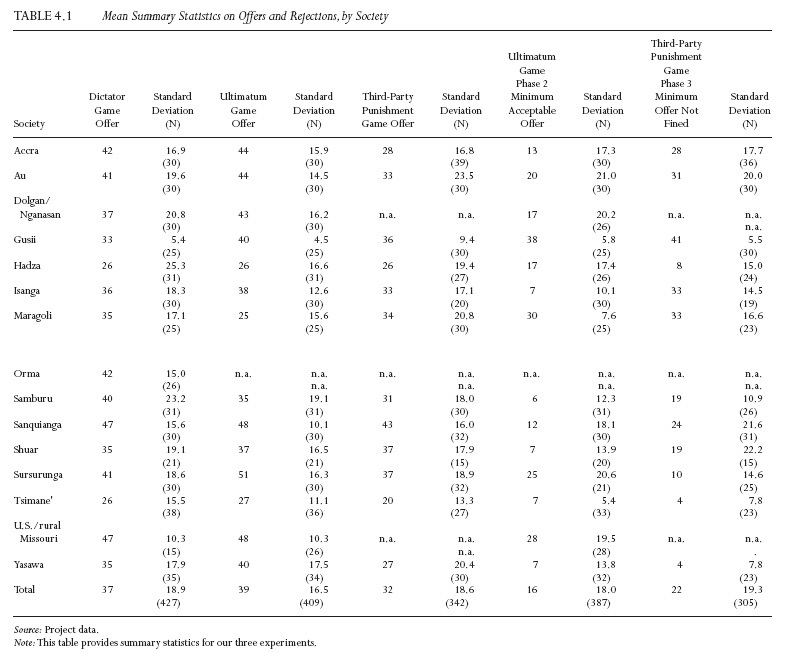 Interestingly Ensminger & Henrich reject possible genetic causes for the variation, even though they themselves report that the heritability of rejection behaviour in the Ultimatum Game is >40% in a sample of Swedish twins. E & H appeal to the standard logical argument that the within-population heritability of a trait does not imply anything about the between-population heritability of the same trait. That’s true, but it doesn’t foreclose the possibility that between-population variability is also partly heritable, either. Their argument is that as societies grow larger and more complex (e.g., more market integrated), the social norms which are required to function in society adjust slowly to match the societal evolution. Of course that’s an inference from a cross-section, not capturing change in norms over time within societies. But they do have a theoretical model for a positive feedback between norms and societal scale with which their data are consistent. “Why does the scale vary so much among human societies, with some societies lacking much collective actions beyond the extended family while others organize millions in modern nation-states? Basically, the reasoning is very similar to what you find in modernisation theory. The pace of cultural change is linked to the pace of economic development, which is treated as exogenous; or at least the trigger for the positive feedback cycle of economic development and cultural change is exogenous. So if development is slow or non-existent, then traditional social institutions are also slow to change. Even maladaptive norms can be stuck in a trap. But a shock can put a society onto a path of evolving pro-social institutions. As social systems based on kin networks get disrupted by economic development, people grow more dependent on impartial norms, i.e., norms of fairness which apply to both in-groups and out-groups. This is echoed in numerous papers in the “cultural evolution” literature, e.g., Hruschka et al., Hruschka & Henrich, Newson & Richerson. That’s the theory, anyway. But for someone interested in economic & social development, the causation they posit is a bit disappointing. I want to know how much the capacity for pro-social norms drives economic & social development, not vice versa. Also, Boyd & Richerson’s reasoning is rather similar to that in biological evolution. If the palaeontological or archaeological record shows it took X million years for binocular vision to evolve, then, that’s how long it took and the job of your model is to spell out the mechanism within the dominant theoretical paradigm. In the case of “cultural evolution”, the assumption seems (to me anyway) that how ever long it takes for a set of norms to emerge, is how ever long it takes, and you should model it as cultural evolution regardless. An Indonesian whaling village displays fairness norms in the Ultimatum game which exceed the ‘perfect’ 50-50 (proposers tend to offer more than 50%), presumably because their whale-hunt economy is completely dependent on team effort and strong social cohesion. But is that all it takes? Maybe these one-shot trust games don’t really give us fine enough information about the norms required to evolve into a modern complex market society. I stress I am not questioning the external validity of one-shot games. But they don’t really seem to generate enough variation beyond a certain societal scale, for explaining the cross-country heterogeneity in social institutions. Or so it seems. I should note that the economics literature on culture & institutions mirrors the argument by cultural evolutionists to some extent: culture and institutions mutually reinforce one another and co-evolve. That is, cultural differences are reinforced by institutions which are themselves path-dependent products of earlier cultural differences. That is almost certainly true, but it does not seem sufficient. I mean, I’m sorry, but I cannot believe that the experience of having been free cities in the Middle Ages is what gave the North of Italy more social capital than the South of Italy, as is argued by Guiso, Sapienza, & Zingales. Becoming a commune was not exogenous! So I don’t find the culture-and-institutions literature terribly satisfying on the largest questions of political and economic development, either. 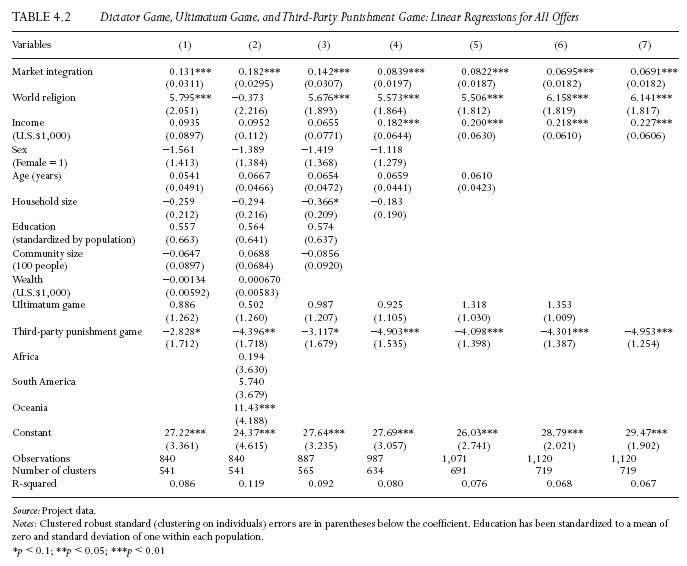 This entry was posted in Cultural Evolution, Economic Anthropology, Institutions, Social Evolution and tagged behavioral games, Dictator Game, Economic Experiments, Experimenting with Social Norms, Fairness and Punishment in Cross-cultural perspective, Foundations of Human Sociality, Jean Ensminger, Joseph Henrich, Third Party Punishment Game, Trust games, Ultimatum Game. Bookmark the permalink. First, it’s good to have pseudoerasmus back on the beat after what seems like a long summer. i hope you were off having fun somewhere, but I’m personally glad to detect the sparks of your nose on the grindstone. That plots me somewhere on the “IS” ( = ‘intellectual stimulation) game that Henrich, for some reason, doesn’t use. I’m guessing that that you are going to challenge our cultural norm of not considering genetic causes for between-culture differences. it’s interesting that the economic historian in the Cliodynamics issues is ian Morris, a paid-up-lifetime institutions guy, who doesn’t even refer to Oded Galor, the economist/historian who would seemingly have the most to say about this.